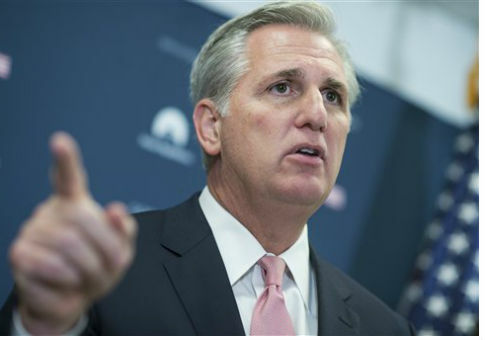 House Minority Leader Kevin McCarthy (R., Calif.) slammed Democrats for abdicating leadership on Israel and Jewish issues Monday, warning that House Republicans would be stepping into the breach. "Members of the Democrat caucus have increasingly and alarmingly used anti-Semitic language," he said in a statement. He accused Democrats of "undermin[ing] the shared values and unbreakable bonds between the United States and Israel." The comment follows a weekend when Rep. Ilhan Omar (D., Minn.) made a series of ill-advised tweets concerning Jewish Americans, the state of Israel, and the United States government. Omar peddled in anti-Semitic stereotypes, mischaracterized a pro-Israel lobbying group, and garnered praise from the former Grand Wizard of the Ku Klux Klan. In a tweet Sunday afternoon, Omar shared a tweet from far-left journalist Glenn Greenwald. Greenwald claimed McCarthy was "defending a foreign nation' and "attacking free speech rights of Americans." In reply, Omar claimed elected officials acted for Israel out of financial interest. "It's all about the Benjamins baby," she said. The reference is to $100 bills, which have Benjamin Franklin's face on their front. Opinion editor at the left-wing magazine The Forward Batya Ungar-Sargon, who has staunchly defended Omar's comments in the past, criticized her, calling it "the second anti-Semitic trope you've tweeted." She asked who Omar thinks "is paying American politicians to be pro-Israel." AIPAC, the American Israel Public Affairs Committee, is not a political action committee (PAC). It is prohibited by law from donating to candidate and neither rates nor endorses candidates for office. It is a major lobbying organization in Washington, and has on numerous occasions failed to change presidential policies concerning Israel and the Middle East. This included disagreements with Presidents George H.W. Bush, Ronald Reagan, and Barack Obama. Nevertheless, the trope persists that the pro-Israel lobby maintains undue influence over the making of American policy. Omar's comments and the condemnations they garnered prompted David Duke, the former Grand Wizard of the KKK, to come to her defense. Replying to former Ambassador Nikki Haley, who condemned Omar, Duke claimed "that the most powerful political moneybags in American politics are Zionists who put another nation's interest (Israel's) over that of America." In another tweet, Duke took aim at AIPAC, accusing it of nefarious influence. In a 2012 tweet, Omar accused Israel of having "hypnotized" the world. She has since apologized, claiming ignorance of the comment's implications. During her congressional campaign, Omar spoke in a Minnesota synagogue and claimed to oppose anti-Israel measures, including BDS. Immediately after she won election to the House, Omar came out in support of BDS. The accusation that Jewish Americans are loyal to Israel as opposed to their country of citizenship is a classic anti-Semitic canard. A 2018 publication from the Begin-Sadat Center for Strategic Studies argues that, "[i]n its most extreme form, the charge of dual loyalty amounts to an accusation of treason." The Center explained that the accusation was pervasive and unsubstantiated. Rep. Rashida Tlaib (D., Mich.), one of Omar's close allies in the freshman congressional class, called a pro-Israel piece of legislation. "literally an attack on our Constitution." She also claimed that the senators responsible for the bill "forgot what country they represent." Tlaib later clarified that the comment was directed at the senators, not Jews. Sen. Marco Rubio (R., Fla.) condemned Tlaib's remark as "a typical anti-Semitic line." Following Omar's series of tweets, McCarthy pledged action in the House. "House Democrat leadership continues to be silent as Americans from both sides of the aisle condemn this rhetoric and pattern of behavior," he said. "In the face of that abdication of leadership, Republicans will take action this week to ensure the House speaks out against this hatred and stands with Israel and the Jewish people." Speaker Nancy Pelosi (D., Calif.) and Democratic House leadership did condemn Omar for her "deeply offensive" remarks. Nevertheless, she remains a member of the powerful House Foreign Affairs Committee, a position Pelosi could revoke. On Monday morning, Omar did offer a conditional apology, again claiming to regret her use "of anti-Semitic tropes." She immediately went on to invoke AIPAC by name and challenge its "problematic role" in politics. This entry was posted in Issues, Politics and tagged AIPAC, Anti-Semitism, Ilhan Omar, Israel, Kevin McCarthy. Bookmark the permalink.